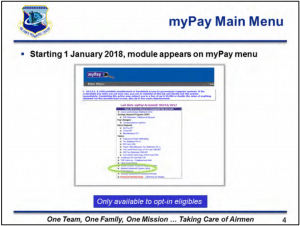 Servicemembers with a Date Initially Entered Unformed Service (DIEUS) of 31 December 2017 or earlier, and less than 12 years of service (for active component members) or less than 4320 retirement points (for reserve component members) may opt-in to the Blended Retirement System (BRS) if desired. Elections are irrevocable, so servicemembers should carefully consider each plan and seek financial counseling before making a decision. If you are eligible, you should consider opting in. 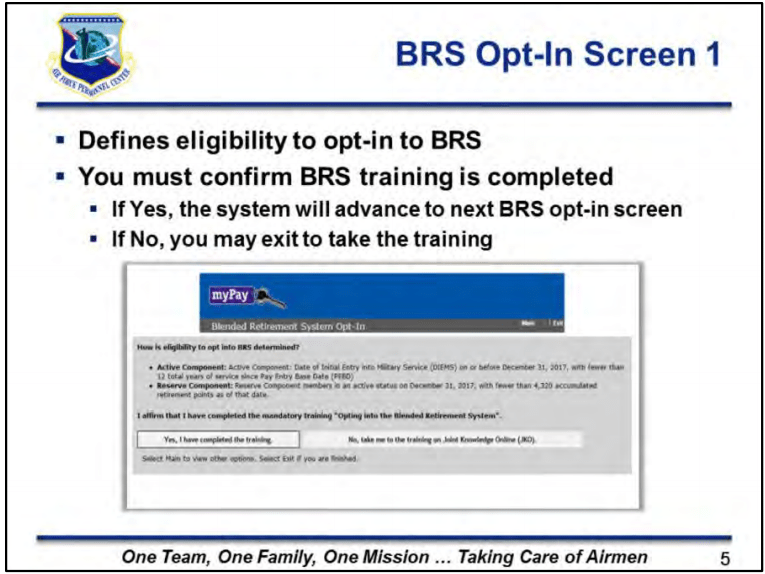 I am opting in, mostly because of the increased flexibility the new military retirement system offers versus the old High-3 system. The up to 5% match on contributions to the TSP means you can put away some extra savings for retirement while you serve. If you separate before 20 years, you can take these matching funds with you, rather than getting nothing in the current system. 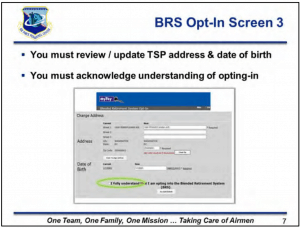 If you DO NOT want to opt into the BRS and stay under the old system, no action is required on your part. You are automatically grandfathered into the old system. 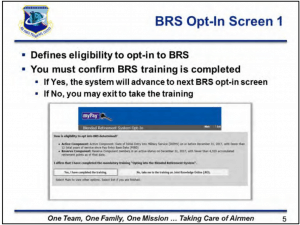 You should only consider NOT opting into BRS if you think you have a good chance of staying until 20 years. 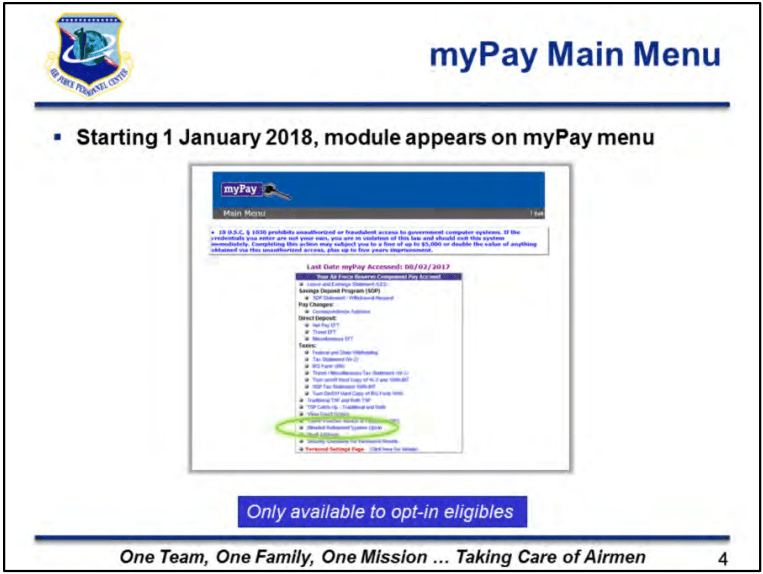 The opt-in module in myPay will only open to those eligible to opt-in. It will probably be calculated automatically from data in your myPay account. If you think there is an error, let finance know ASAP so they can manually review your info. Before you opt in, you must certify you took the DoD opt-in training, provide your date of birth, and give your address for your TSP account. You must also acknowledge the BRS election is irrevocable. You cannot change your mind once you opt-in. Next screen will remind you who is eligible to opt-in and will ask you to confirm you have completed the Joint Knowledge Online (JKO) training for the BRS. 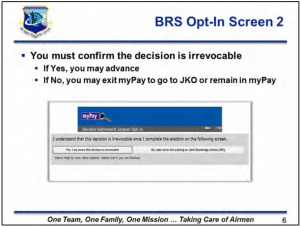 Next screen will ask you to confirm that the decision is binding and cannot be changed. Next screen will have you verify your mailing address and validate your date of birth. Check the box to confirm you understand you are opting in. This is irreversible. One last verification of all the information you are about to submit. 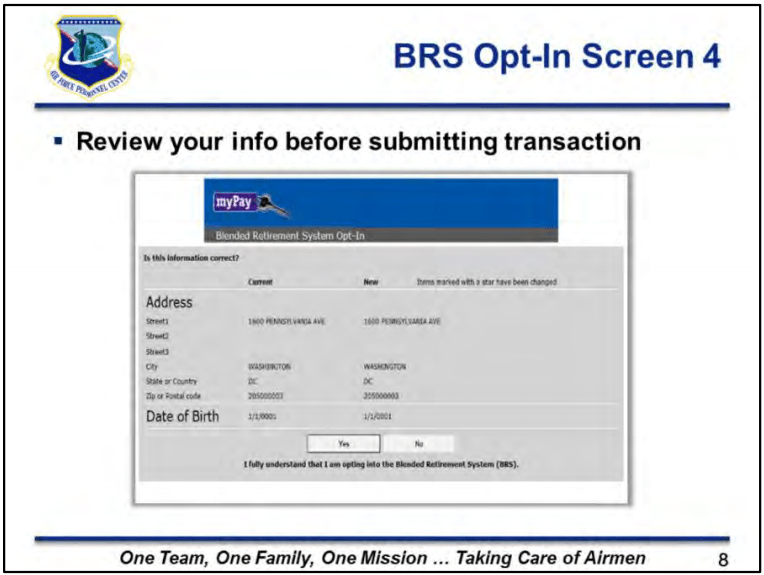 Click yes to opt into the BRS. Last screen will be a confirmation of what you just submitted. I recommend you print to PDF and store in your cloud storage (like Google Drive) or print a paper copy for your records. If you are approaching 12 years of service, it might be important to prove when you opted in to be eligible for continuation pay. It will take 3-7 business days for the election to be finalized. 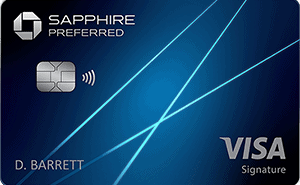 You can check myPay to verify acceptance of the transaction. Confirmation emails should also go to you from DFAS once the transaction is processed and your TSP account is established. 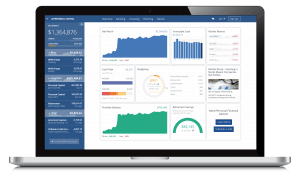 Your contribution will initially be 3% into your Traditional TSP account. You should login and change it to at least 5% and probably a Roth contribution, depending on your taxable income. 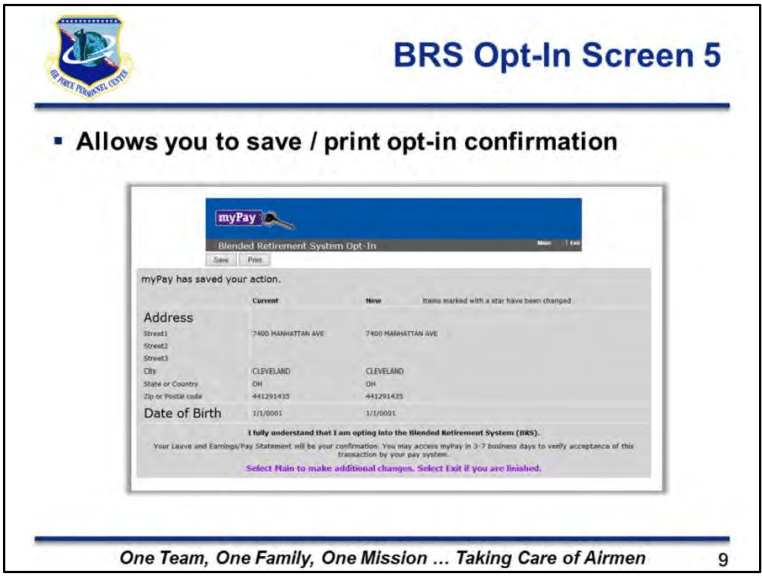 You can download the official Air Force myPers briefing on the BRS opt-in procedure here. 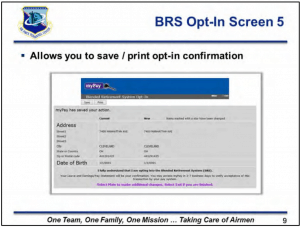 If you are going to opt into the BRS, do so earlier in the year. That will give you the most matching for 2018. 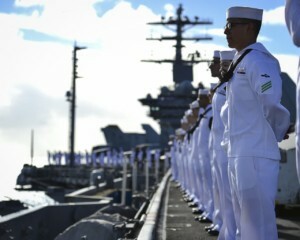 Now is a great opportunity to increase your retirement savings and give yourself more flexibility in your military career. After you have opted in, add your TSP account to your Personal Capital account to easily keep track of your investments.